So, this week I am celebrating Teacher Appreciation Week. Or as some people call it…Spring Break. Because trust — nothing makes me appreciate the woman who keeps my son all the livelong day, than a nine day refresher course in nonstop quality time. When kids are little, they are so chubby and giggly, and you sob at the thought of Kindergarten and get all judgy at parents who are dreading Summer Vacation. I know because I was that judgy mom once, so enraptured and enthralled with the process of child raising that I couldn’t imagine ever feeling any different. I might be projecting. Sorry. Anyways, I love my son more than life, truly. But after nine days of being cooped up with a fussy baby, I have a feeling we will both be ready for school again. And it *might* be a good idea to treat a special teacher to a cute dessert. She deserves it, don’t you think? 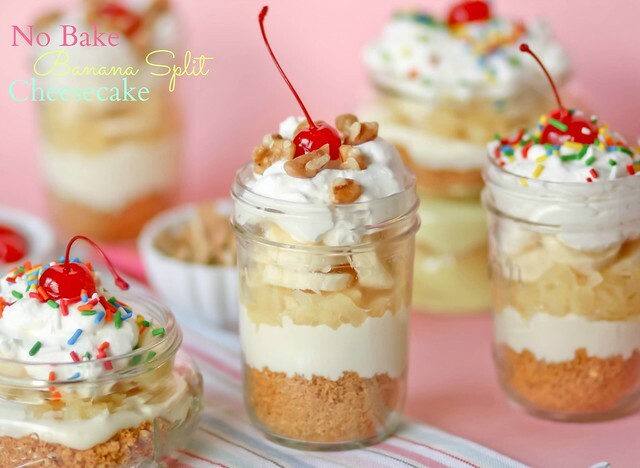 Have you ever heard of Banana Split Cake? 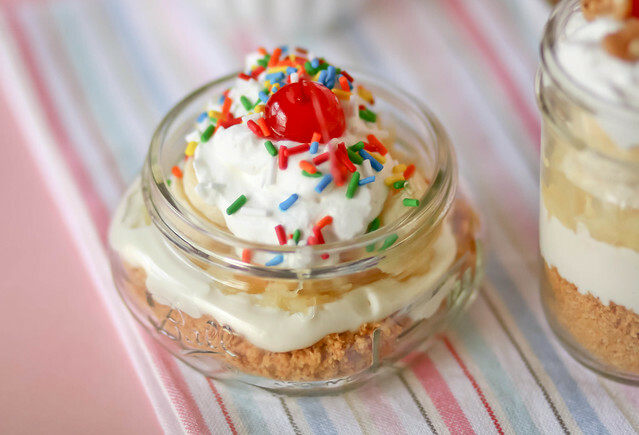 It’s a no-bake layered dessert with a graham cracker base, sugar/egg/cream cheese filling and banana split toppings. I’ve always wanted to try it, but the raw egg thing skeeved me out. So I decided to make my own version with no bake cheesecake filling in lieu of the eggy stuff. I made these in jars, but you could totally make it in a large deep dish pie pan or 9×13 pan. No biggie. In a large bowl, combine graham cracker crumbs, melted butter, and sugar. Press into the bottom of a 9x13 pan, a deep dish pie pan, or spoon into 12 small jars (I just use the small canning jars they sell at Walmart). In the bowl of a mixer, beat cream cheese with the whisk attachment on medium high speed until smooth. Add sweetened condensed milk and vanilla and beat on medium for another minute or so, until smooth and combined. Spread cheesecake in pan, or spoon evenly into jars. Top with pineapple and banana slices. Place a metal mixing bowl and the whisk attachment to your mixer in the freezer for about 5 minutes. Remove bowl from freezer and add 2 cups of cold cream and 1/4 cup powdered sugar. Beat on high until cream is thick and the whisk is leaving lines in the whipped cream -- keep an eye on it though or it will turn to butter!! Spoon whipped cream over sliced bananas, top with cherries, sprinkles and walnuts. Keep uneaten portion refrigerated. I love how pretty and versatile this dessert is — you could add hot fudge or strawberries…so many possibilities!! We aren’t on Spring Break yet, but it’s Sunday night and I Lord help me, I am ready for school tomorrow morning. I might need about 70 of these over our Easter Break. Love these jar desserts. And banana splits. And cheesecake. Clearly, I want these. 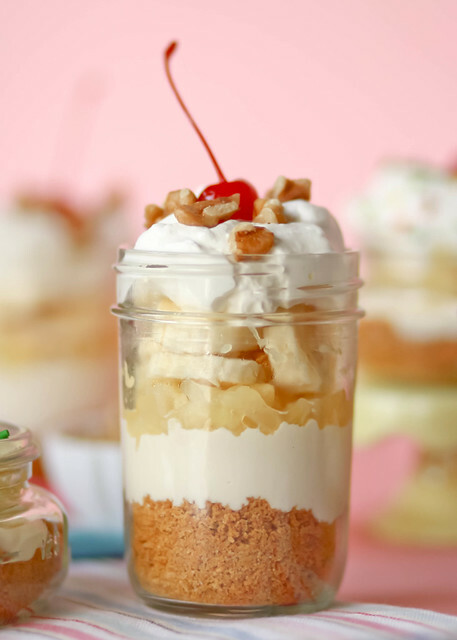 When I see a dessert in a jar it just looks 10X better to me! I think I would add some strawberries as you suggested! YUM! This looks so lovely! I can’t freaking wait to try this!! This looks so good, I want to make it right now! I love the presentation in the mason jars now! This looks delish. Spring break is just annoying to me because i live in a touristy place, so everybody flocks here. Traffic gets way worse, people randomly stand in the street to take pictures of buildings and you have to dodge them…it’s exhausting. Then, school starts again, the tourists leave, and you’re stuck in “school traffic” on your way to work again…hum, no break. I need a banana split cheesecake please. I think these would work well for mommy appreciation too after dealing with crazy kiddos! I love the YOU ARE HERE prints! So cute, as is everything on their site!! These are so darn cute–perfect to screw on the cap and tag on a picnic! HA! I’m not a parent, but I am an uncle… and I know how exhausting it can be to have to run after a child all day long (actually, I don’t… but I see it on the faces of my sibling and my husband’s brother). I think y’all deserve one of these treats. Just be sure to keep one for yourself before you send the rest to the angel (aka your son’s teacher). These guys look so cute and delicious! Love these jar desserts. And banana splits. And cheesecake. Clearly I want these. I love them in the little jars! Cuteness! Would love to try this recipe. What is the equivalent of stick to cups/mls for butter? Don’t think we have sticks of butter here in the UK. And when you mean placing metal bowl with whisk attachment, will the cream cheese be in it then add the heavy cream? Sorry got a bit confused. These are so cute! 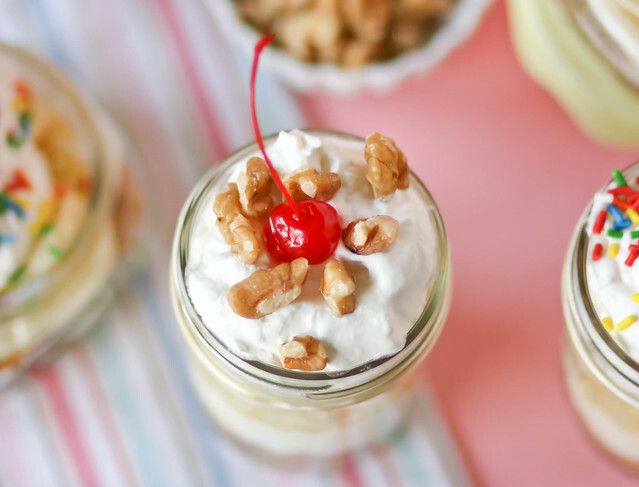 When I see a dessert in a jar it just looks 10X better to me! I think I would add some strawberries like you suggested! YUM! These look adorable and delicious! Perfect for spring. It’s a interesting along with helpful part of information and facts. I’m just delighted which you simply distributed this handy details around. Make sure you be you current this way. Many thanks for sharing. If you can find it Kraft makes a ready made cheesecake filling. You could use it in this recipe. I’ve only found it in newly opened Walmarts with a full grocery store. I keep it in the fridge and if I want a scoop with maybe caramel sauce, strawberries or whatever it’s there. I only recently came across this recipe and would like to make it for this weekend. I’ve got some time constraints though. Up to what layer in the jar do you think I can refrigerate in advance. I thought maybe the first two and wait on the pineapple and so on until right before serving? Do you have any experience making them in advance? Thanks! !